With the question of who exactly is interested in mobile learning, in the back of our mind, Float got down to the bottom of things. By monitoring the companies who have been frequent visitors to our website, downloading our content, and reaching out to our personnel, we determined which vertical markets are most interested in mobile, microlearning and mobile apps for performance support. 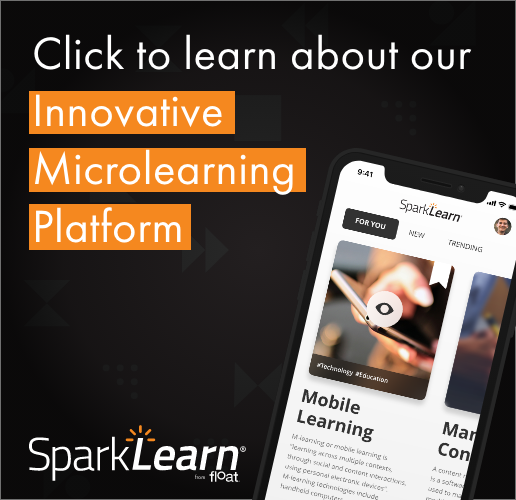 After studying the key metrics including industries, website visits, documents which were downloaded by the individual industries, we produced a dataset of the Top 10 Industries interested in mobile learning. Want to see the rest of the list, check this out here. Why Mobile Learning for Retail? The retail industry can have a tough time maintaining a solid skill-development trajectory for its workers. Due to the high turnover rates, ever-changing inventory, and a sense of rushing to train new employees, it can be difficult for workers to adapt quickly to this high-velocity environment. As an example, how many times have you asked a sales associate if they carried a specific item or if an item was right for you, and the employee didn’t know? Did they lead you on a wild goose chase? Did they hunt down a coworker to ask if the store carried the item? Did they pull out a phone or tablet and seek the info on the spot? Retail employees work under tremendous pressure and frequently have a long need-to-know list of inventory and products. It is no wonder that these diligent workers need access to learning solutions and information at the exact time they need it – after all, the customer is always right! Float has found that the most effective and efficient way of supplying this information to employees is through mLearning or mobile learning. One of the most important reasons mobile learning is so useful in the retail industry is because it gives employees the information they need right away. In the age of technology, training must evolve. Many retail employees don’t have the time within their schedules to meet and attend weekly meetings and product update seminars. Training is also expensive and prevents workers from getting to their primary roles and responsibilities. Not a great combination for employees with a high turnover rate and who frequently are only employed part-time. According to Deloitte’s research, the average employee only has enough time to devote 1% of their work week to professional learning and development. This statistic means employees can only allocate 24 minutes per week or 4.8 minutes a day for a standard 40-hour work week. So what is the easiest way to train your employees and keep them up to date with everything else that they need to know? Well, what do employees carry with them? Yes, it’s their mobile phone. Over 67% of retail organizations offer mobile learning in some form. Of those mobile learners, 99% believe mLearning has enhanced their overall experience. The mLearning market is predicted to reach $37.6 billion by the year 2020. We live in a world where people want answers right away, and due to the capabilities of our mobile devices, we can get most answers in a matter of seconds. Having the knowledge— or the means of getting the profit from the product. Sales associates in the modern era are faced with the who, what, when, where, and why in retail. This is one reason many companies require their employees to become certified in certain product sales. They must ask “who” is my target customer, “what” will they be looking for, “when” is this in season, “where” will the product be in the store, and “why” should I know the information about the product? Many companies like OnPoint, are looking into ways to enable sales and training teams to develop easy-to-use solutions to assist sellers by giving them tools to prepare and inform them— even during the sale itself. Bass Pro Shops is one of the most revolutionary and destination-set retailing establishments in North America, and they are using OnPoint’s CellCast Solution platform. The platform assists in training and certifying the sales associates responsible for selling Bass Pro’s most profitable products: the Tracker Marine sport and fishing boats. The Bass Pro retail sales team members can now become certified in the Tracker Sales Certification Program through the use of shared iPads in each store location. Each if the different training modules and courses can be completed offline on the device and result in a 100% certification milestone for all employees across the Tracker Marine Group. The product knowledge also raises overall customer satisfaction scores. But Bass Pro Shops isn’t the only company using mobile learning. Float has worked with Home Depot to help the company create an in-store product decision making assistant and informational app which helps retail associates assist customers within the store. The sales associates can access store-specific information regarding products and way-finding to guide the customers through the store to help them. Besides those helpful tips, it can also prompt associates regarding related products and opportunities for up-selling/cross-selling to customers. Float hasn’t just worked with Bass Pro, but also Maui Jim, the premium sunglasses retailer to create a quick order and inventory app for their B2B market. Hundreds of global account executives use the app to quickly filter through a listing of over 400 products. They can then determine which of those products their accounts need and be guided to their next stop through the use of geolocation. Also, account executives can create orders offline so it will submit them when they reconnect to Wi-Fi or their cellular network. The iOS app integrates with many of Maui Jim’s existing systems, including SAP Hybris, AirWatch, and Adobe Scene 7. Check out this infographic for more information about what else Float is doing within the retail industry with mobile technology. Everything from the front of house help like planogram compliance and planning to back of house logistics and task management is fair game in this rapidly changing space. So what do you think? What are your thoughts on how mobile learning within the retail industry? Can you think of any other examples? Are you in the retail industry? How are you using mobile technology with your employees?